Let’s start off by talking about the weather. It was nothing short of magnificent! In fact it would have to be the two best back to back flying days in recent memory! We flew under clear skies, a warm sun with a very gentle breeze. And most of us got a little sunburnt. Yes, sunscreen in winter was the go for those lucky flyers that chose to have a very pleasant weekend in sunny Albury. A well known Melbourne TV sports commentator would no doubt describe the weather as being ‘Special’. 27 Diesel Goodyear got the ball rolling with five teams entered. Although this event has recently taken NSW by storm, it was the first time that some Victorian teams have had a go at it. It certainly passed the test and no doubt will become a regular part of our contest calendar. The good news is that nobody was pinged by the Speed Police! This new event has lots of good points; one being it also allows pitmen to grab the handle and race with confidence at an easy to fly speed. It was good to see Paul Stein swapping his usual pitting duties with Ric Justic and making his presence felt in the middle. They posted the fastest heat time of 5.18.34 with the dieselised Cox Conquest in the Cassut Boo Ray. John Hallowell and Andrew Nugent had the new Mr D. and R250 on show. With an 8×6 prop, it was running in the mid 27’s and was fast enough to grab second spot in the final with 5.24.00. Graeme Wilson and Mark Ellins had resurrected an Ol’ Blue and popped an Oliver Tiger Mk 4 in the business end. It showed a lot of promise and posted a 5.28. Good, close racing and only 10 seconds between the top three teams! Murray Wilson and Ken Hunting had a few issues with their racers, as did Harry Bailey and Jim Ray. The good news is this relatively simple event should not take much work to come up with a reliable set up. The final was a close race with just over half a minute separating the three teams after 200 laps. John and Andrew had a really good tune on the R250 and that gave them a slight edge in airspeed over Paul and Ric’s Cox Conquest. Ric said later he should have bumped up the comp a bit… Graeme and Mark were always a threat but it would have taken a mistake by the others for them to get by, and that didn’t happen. Classic B was next. Again, there were five teams entered. Harry Bailey and Ken Hunting got the ball rolling with a smart 3.11.69 from the Brodak powered Galaxie. They elected not to start in round two. Although they had plenty of airspeed with the green Crescendo, Murray Wilson and Jim Ray did not get the instant starts they would have liked and a 3.22 was the result. They hoped for a big improvement in the second round, but similar troubles saw a 3.34.72 entered on the CD’s notepad. Next time! Richard Justic was flying Paul Stein’s modified Rocket, stylishly painted in the usual battleship grey. The Irvine was howling and, as predicted, the plug was alive and kicking all afternoon. A 3.04.91 first round was a virtual guarantee of making the final, so they opted out of round two. John Hallowell had Andrew Nugent flicking the OSFX Streak. A slow 3.14 first heat was corrected in the second round with an FTD 3.00.56. The final was a good race with John and Andrew getting home first in 6.11. They picked up a blockage during the last tank and they slowed noticeably. However, the reliable 50 lap range of the OS gave them the edge with a two stop final. Ric and Paul’s Irvine had the best speed was only good for around 40 laps and that meant it was a 3 stop 140 lap final for them. As an extra stop with a long glide can add 15 to 20 seconds to a Classic B race time (depending where the models cuts out in the circle) they did very well to get within a couple of laps. Harry and Ken soldiered on to finish on 6.56.16 but the plain bearing Brodak was outgunned by the ball raced engines this time at Albury. Vintage A was the next event. 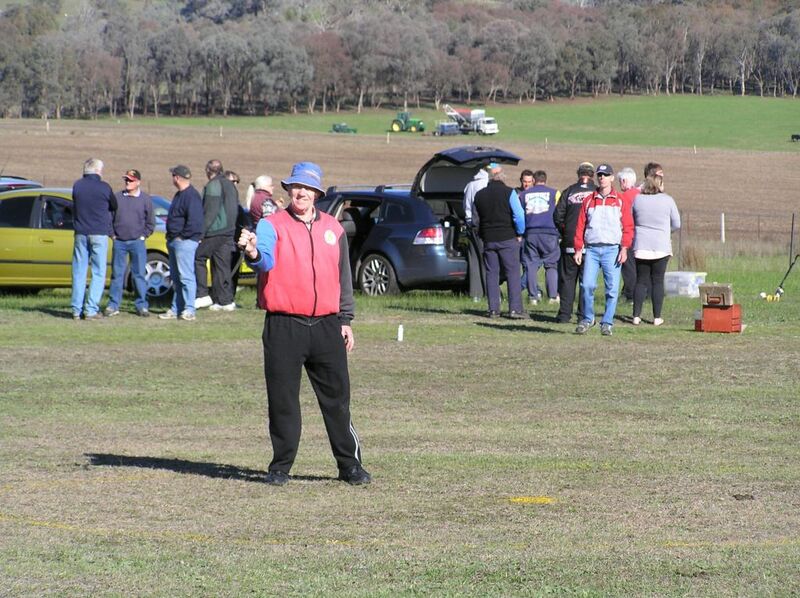 Yet again, it was five teams that rolled out their lines under a sunny Albury sky. The first heat was a beauty! John and Andrew crossed the line on 3.21.75 just in front of Ric and Paul on 3.25.91 and Harry and Ken on 3.27.16. That’s the way team racing should be! Murray and Jim Ray tried hard with the R250 Voodoo but their first round time of 4.18 was nowhere near their best. They did much better in the second round posting a much better 3.28.81 but they still missed the final by about a second and a half. Ken Hunting again doubled up with Harry, but his model was off the pace with a 4.58 .16 and a 4.24.57. The final was a beauty… very close and hotly contested. Justic/Stein proved the eventual winners withy a slick 6.55 with the all grey Dimpled Dumpling. Hallowell/Nugent were a touch lean on the first tank and the red D.D. took a while to get up to the maximum airspeed. Those six or so lost seconds proved impossible to make up. Harry’s model was using a Graupner 7×7 that gave spectacular acceleration from a standing start. Next Albury contest will be part of the NSW State Champs on the first weekend in October. If it is half as good as this meet, it will surely be a ripper! Classic FAI Team Race – What a fantastic weekend. We were all delighted to experience beautiful weather after leaving soggy Melbourne for the June Albury comp. 6 entries arrived to fly Classic FAI T/R. Of note were the 2 new Parras of John Hallowell and Paul Stein. These engines seem fairly easy to set which will make racing them easy and enjoyable. Best times of the day were Justic /Stein 4.26(Parra) and Nugent /Ellins 4.33(Fora) using 15thou lines as per the newly introduced rules. All teams should change shortly to the new line diameter. The final set out to be a ripper between Justic /Stein , Hallowell/M.Wilson and Nugent /Ellins. All was well until at lap 161 on our last stop the back of my Sapavolov model broke causing us to DNF. Paul and Richard went on to win followed by Murray and John. 2 Parras at the top of the tree. Well done to all. Thanks to every to helped make this weekend a great success. Hope to see more there next time .